- The Gaia Fashion Sets have been added! *These are an extension of the Black Dragon Sets! *You will find the NPC Aoife in Flaris next to the postbox! *You can find out the requirement for these sets from this NPC. *Added a Special Exchange Quest Series! *Note that these Sets are class dependent! *You still have the opportunity to exchange the set for the classes of your choice later for a fee! *The set will be needed for further upgrades in the future, if any should come in the distant future! 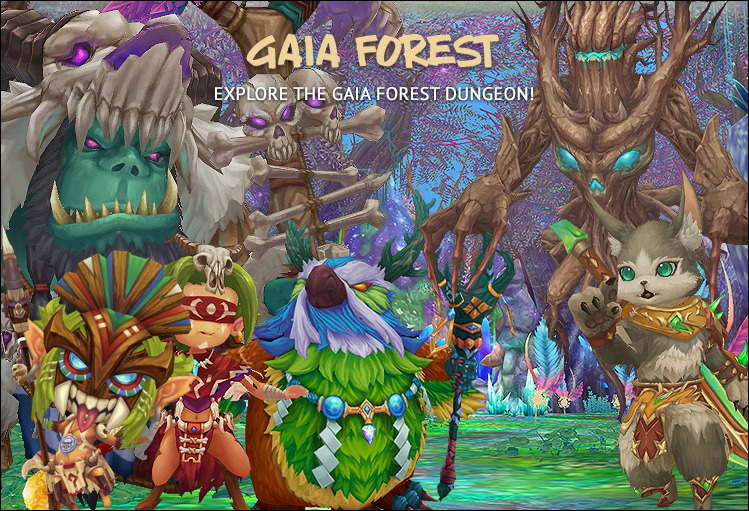 - The Gaia Forest Dungeon has been added! 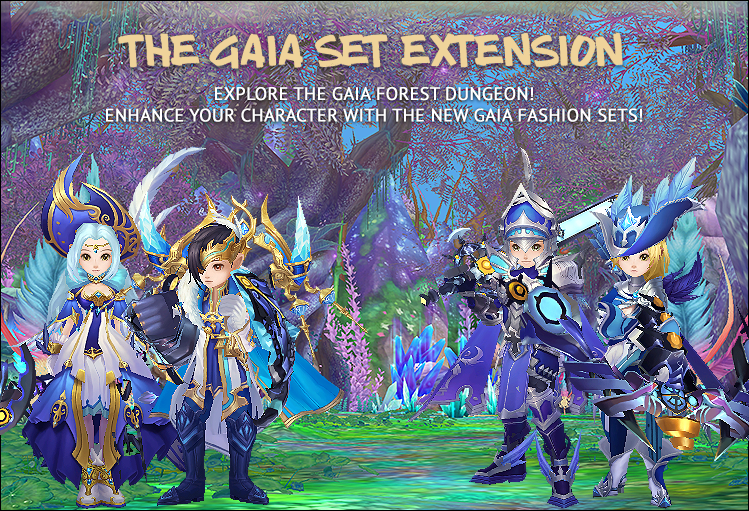 *You can collect material for the Gaia Fashion Sets in this dungeon! *You also have the chance to get Gaia Weapon Models dropped from the final boss! *The end boss also offers the possibility to drop pick-up pets with the models of the Dungeon Monster! *Some adjustments to the dungeon will follow! 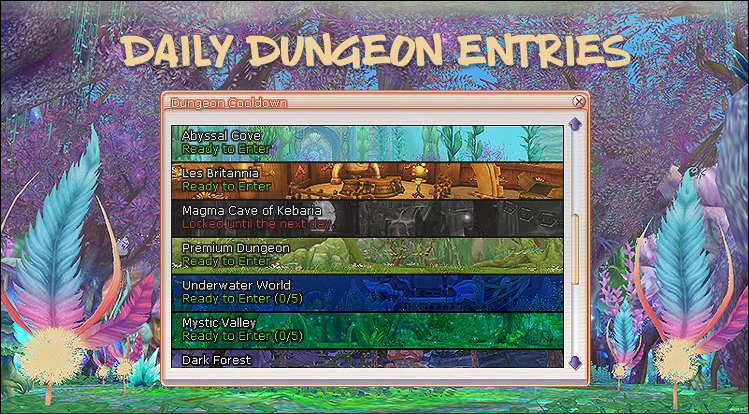 - The Daily Dungeon Entrie System has been added! *Some dungeons now offer you the opportunity to enter the dungeon every day without getting a cooldown for a few times! *With an active Premium Status, you can join a Dungeon 1-2x more per Day! *INFORMATION: The system has been removed for today and will be released tomorrow with a fix, please be patient a little bit. - Dungeon timeruns for lighter dungeons! *We've added dungeon timeruns for lighter dungeons, where you get a few extra small items as a small bonus. *Anyone who kills the Endboss with an Active Dungeon Timerun will receive the respective reward. *This timerun does not require normal monster kills like in Hardmode Heroic timeruns! - The damage and block rate in the Rhisis Trail Dungeon has been reduced enormously! - The block rate of the monsters in Shaduwar, Valley of the Risen, Kaillun and Bahara Desert, has been greatly reduced! - The Guild Siege power-up boxes have been added to the Guild Siege administrator. *These boxes contain some valuable power-ups that can only be used in the Guild Siege. *These, if active, can not be stacked with normal power-ups in the Guild Siege. *If you leave the map with Guild Siege Power-Ups active, they will automatically be debuffed on your character! - The / buff feature will now buff your character automatically with all selfbuffs! * This feature will also be added to Buff Pang in another patch! - Improved the Monster Positioning. - In the Premium Dungeon, the Awake & Fusion Awake augmentations have been added! *You receive Ores from the final boss, which can be exchanged for a Bound Augmentation of your choice! *Another Entropia Treasure has been added to the Premium Exchanger. *INFORMATION: The price of this Treasure will be lowered from 1000 to 800 tomorrow! - Added a new Knight animation! - New animations under "O" have been added! *The window will be adjusted by us, so there will fit some more animations in the future! - You can now exchange stacks of blood orbs for blood orb bags! *These can be converted back! - New effects for characters have been added, which will be important for balance reasons later. - The bug that freezes the game on exit has been fixed! - Fixed a bug that caused a client crash with certain items on the player black market auctions. - When switching equipment with the Equip Switch System, a Laccotte from your inventory is now automatically used, unless it is restricted on the map. - The Online Bonus Buff has replaced the Penya Rate effect with PvE Damage! *You will get the same number of Perin when you use these parts as when you sell them at the NPC! - The drops at the end boss in the Arena of Fear have been changed slightly. - Some emblems have been added to the Cash Shop Laura NPC in Flaris. *More emblems will follow there in the future! - The Black Weapon Reroll recipe now requires 10 instead of 20 Reroll pieces! - In the Magma Cave Dungeon you can now drop Olbaid & Baldur as a Pick-Up Pet! - Further security, performance & crash fixes were added. - You now get the Ultimate Mask + Cloak together from the Entropia Treasure! - More fixes, minor fine-tuning of the patch, models etc; will be patched tomorrow during the day! - From Tomorrow there will also be Permanent altered Vote Shop prices. - Starting tomorrow, a new item will also be added to the Premium Shop! - A new feature will expect you in the next 24 hours on our Homepage! - We will also announce some other things tomorrow!